Mixing it up this week with a mid week beauty post featuring a beauty bag essential + a giveaway. One of my absolute favorite beauty products of all time is blush! It just brightens up the face and always adds a bit of color and life. When it comes to my blush crushes Nars, Tarte, and Stila products are just a few at the top of my list. One: Traditional powder blushes are a main stay in my make up bag I seek out products that are highly pigmented and long lasting. 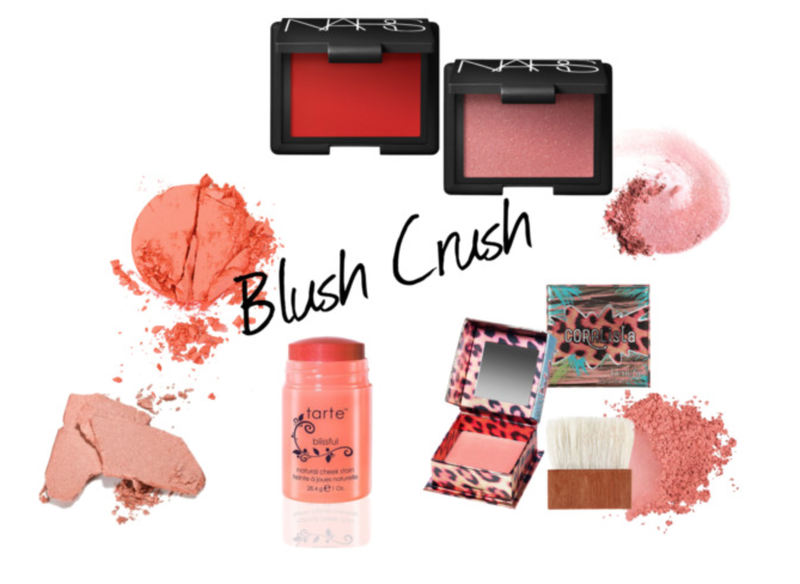 I have a Nars blush crush as the products are vivid and accommodate a wide spectrum of skin tones. I opt for "Dolce Vita" for a natural daily look and "Exhibit A" when I want to paint the town red. Two: Savvy powder palettes such as the Y.S.L. and Bobbie Brown pallets that incorporate a variety of blush color options are a practical option when traveling and compact products are key. Three: Tarte amazonian clay blush provides a vivid pop of color and can be applied dry or wet dependent upon the desired look.Tarte products are a nice alternative for those seeking a natural product. Four: Illuminating and highlighting are the keys to a sculpted and glowing look. I personally love Taj Mahal and Albatross however, for those at the light end of the color spectrum your favorite bronzer can do the trick! Application Tip: "Power V" to ensure that glowing and dewy look around the eyes apply illuminator in a > shape just above the brow and below the eye. A few innovative blush products in fun formulas that work overtime as not only blushes but also as lip and even skin care products. Five:The Tarte cheek stain provides a natural flushed look and is ideal for daily wear and a natural makeup finish. 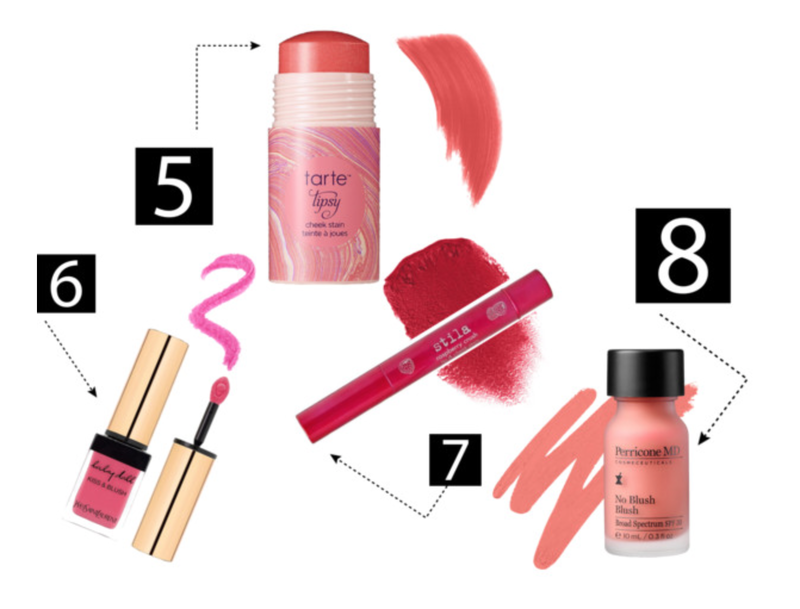 Six & Seven:Yves Saint Laurent's Baby Doll Kiss & Stila's lip/cheek stain are compact multitasking tools that provide a pop of vivid color on the lip and cheeks. 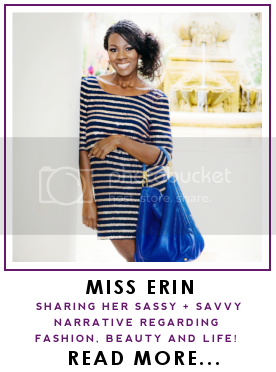 These compact savvy products can accompany you on the go for sassy touch ups. Eight: From the savvy skin care line Perricone MD "No Blush Blush" a liquid alternative that boasts skin care benefits the line also includes a bronzer and foundation. Who’s ready for another sassy giveaway? This time we’re giving away a gift card to one of our favorite places to stock up on savvy beauty essentials -- Sephora! One lucky reader will have the chance to shop till they drop with a $300 Sephora gift card… and it just might be you. You can enter daily over the next two (2)weeks and earn bonus entries by sharing the giveaway with your friends on social media. Good luck! Rules: Use the Rafflecopter form to enter daily. Giveaway begins today 8/13/2014 at 6 PM EST / 3 PM PST ends 8/26/2014 and is open worldwide. Great picks! I also love long lasting blushes!! Currently I'm wearing bronze blushes!! So many fun options thank you for stopping by ! Love the post, I usually go for a rose blush, I need to try the Nars! It is fun to mix thigs up every now and then! I love blush so much! I really am curious about the "no blush, blush" it looks so pretty. I love this post!